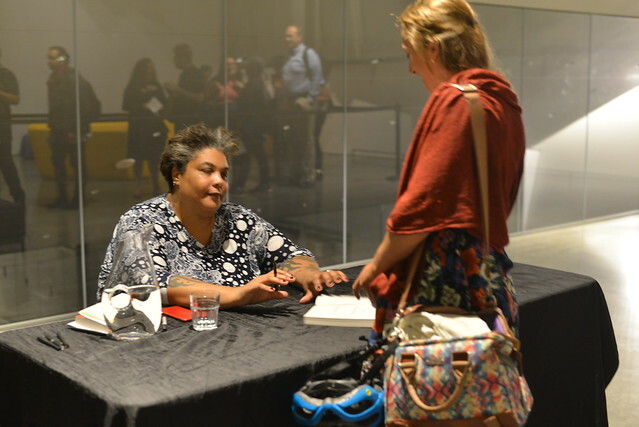 After reading several excerpts from the memoir, Gay fielded questions from the audience on topics ranging from her process as a writer and editor, to intersectionality, overcoming trauma, and what feminism will look like in the 22nd century. The questions were a testament to just how deeply Gay’s work resonates with her readers, and how much there is a hunger are for voices like hers. Many times throughout the evening Gay spoke of the need to speak truth to power, while stressing just how exhausting this can be. “Don’t let them put you in the position of always having to be an advocate,” she said in response to a question about how to navigate a workplace as the only woman of color, and the only queer person in the office. She also emphasized the importance of personal support networks, a theme which recurred throughout the evening. As a writer who has come into her own in the digital age, Gay also spoke to the particular challenges and opportunities of social media as a public platform. To a question about how she makes decisions about what to share online, Gay observed, “lately I’ve been thinking a lot about when to speak and when to listen.” This may seem surprising from a writer who has been embraced for her willingness to speak her truth. Yet, as someone who articulates her views through the more traditional channels of print media as well as on Twitter, Gay acknowledged that thinking about which debates she can most contribute to, when, and where, is important.